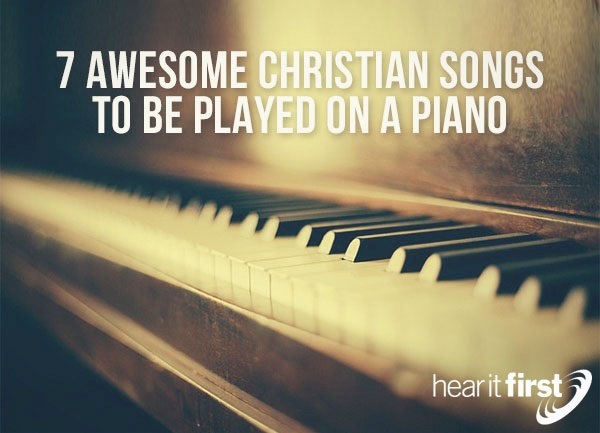 Here are seven great Christian songs you can play on the piano. “Above All,” by Michael W. Smith, may be my favorite version of this song, as it has the greatest piano arrangement of all the other versions I’ve heard, but this song would be a great piano song for any church. Many of Michael W. Smith’s songs place great importance on ascribing to God is that He is above all things, and is preeminent over all things, because all things were created by Him and for Him, therefore, as Creator, He is indeed “above all…” including His lordship over us, but this song is a bit different for Smith as he puts a great deal of emphasis on the suffering of Christ or the Passion, and “like a rose, trampled on the ground, He took the fall, And thought of me, Above all.” Very moving lyrics…and perfect for a piano performance. How Great is our God, by Christ Tomlin, is a song that seems to get people out of their seats during worship music. There are so many “how greats” that we could cover that are recorded in Scripture, but nothing less than the splendor of the King of kings and Lord of lords can be overlooked. He praises our God who is “Clothed in majesty” so “let all the earth rejoice….” because “great is our God,” so this is certainly biblically sound because the worship includes “the Father, Spirit, and Son,” and they plead with the listeners to “Sing with me, How great is our God.” Could there ever be too much worship of our great God? Most assuredly, not! “Amazing Grace,” by John Newton, is the most widely recognized Christian song in church history, at least since the time of Christ anyway, and it is believed that this song or hymn has led many to saving faith in Jesus Christ because the lyrics seem straight from Scripture. Truly, His great grace is greater than the worse of our sins. Alan Jackson has a very nice version of this song that is mostly piano and is perfect for a quiet, more reflective type of worship for Communion or the Lord’s Supper. And then, there is the version by Chris Tomlin, and of course, anything that Chris Tomlin sings is good (that I know of). Chris Tomlin’s version is called, “Amazing Grace (My Chains Are Gone)” but Michael Smith’s version is equally good, but if you ask me which version I love best, I must admit its Chris Tomlin’s version which will be discussed in the following paragraphs. “Come to the Water” may be our church’s favorite worship song because Matt Maher nails just who God saves as he sings, come, and “let all who seek. Let them come to the water. And let all who have nothing. Let them come to the Lord.” Have you ever felt weary, worn, and thirsty? Come, all you all who are “Without money, without strife,” and “All who labor without rest. How can your soul find rest.” Here is where we can all come to the water, and drink of the Living Water, and for all who receive it, they shall live forever, just as Jesus said, “Whoever believes in me, as the Scripture has said, ‘Out of his heart will flow rivers of living water’” (John 7:38). Revelation Song by Phillips, Craig, and Dean is a very special worship song that brings the listener naturally into the worship of God. It’s as if the worship starts taking you over, almost being helpless “victims” of the adoration of God, so it’s like it happens all by itself, and without our help. I particularly like the version where Kari Jobe sings with her sweet, whispering voice that brings us into her own worship experience. The lyrics are spot on for the worthiness that is “the Lamb of God,” as He is “Holy, Holy, Holy, is the Lord God Almighty, Who was and is and is to come.” I would even say it compels all creation to worship and adore its Creator. I could have easily included several others like Kutless song, “Take Me In,” because this song reveals the focus of the Levitical priesthood which was to point forward to the coming work of Christ at Calvary. This song was also done by Petra, so both are outstanding worship songs that bring us into the Old Testament and the imagery of the priesthood which foreshadowed the reality that would be found in Christ centuries later. It is only by the blood of the Lamb of God that can “Take me past the outer courts. Into the Holy Place. Past the brazen altar,” so “Pass me by the crowds of people. And the Priests who sing your praise.” This gives me a picture of what happens in heaven, at the throne of God, as we look behind the veil, now ripped from top to bottom, Christ having ended the separation between us and God that our sins had previously brought (Isaiah 59:2). Even the old hymn, “Nothing But the Blood of Jesus” is great because it shows the love of God in action; on the cross, and telling us that only by the blood of the Lamb of God can we every be saved and that “nothing can make you whole again. Nothing but the blood of Jesus.” What more could I add but “There is A Fountain Filled With Blood” by William Cowper.